If you’re familiar with the mini community over on Instagram or Etsy you will no doubt have seen Steph Wallace’s gorgeous miniatures, accessories and the waves she’s made since launching her brand, Mostly Miniature. We’re big fans here (I’ve indulged in a few Mostly Miniature pieces for my own doll’s houses and can confirm they are just perfect!) so you can imagine the excitement when Steph revealed her latest product, Mostly Miniature’s first doll’s house. 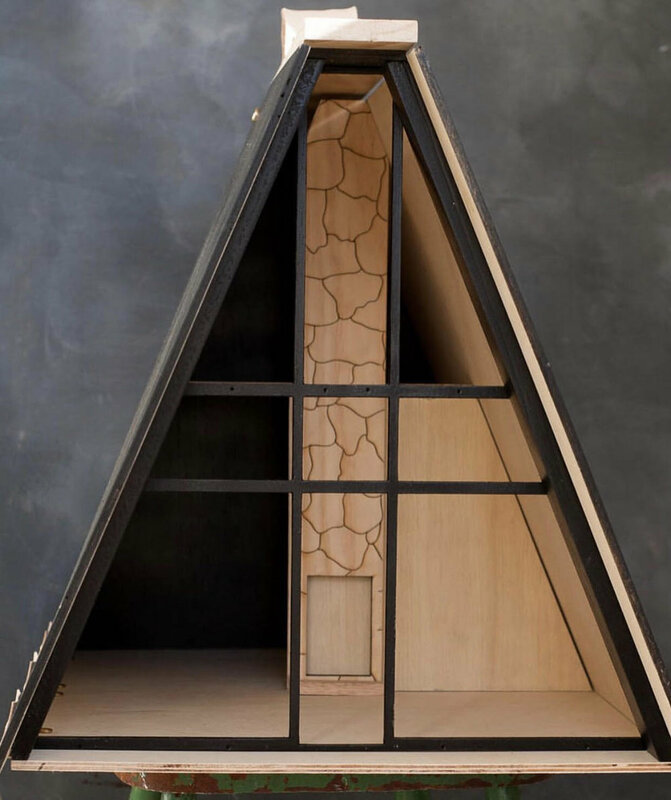 This stunning, hand built A-Frame house is an original design, executed with the high level of craftsmanship you’d expect, making this little home a true, heirloom piece. Built in 1:12 scale, the attention to detail is spot-on, an open, multi-level layout is begging to be adorned with only the most stylish of mini’s, the mezzanine floor is without a doubt my favourite element of this beautifully crafted house, meanwhile a fireplace and chimney breast runs from floor to ceiling, providing a clean, simple focal point to style the rest of your miniatures around. Now don’t get me wrong, traditional doll’s houses will hold an enduring place in my heart, that said, character houses like this promise something just a little different and inevitably get the imagination going! The A-Frame design has its foundations in utility and function, however it became quite the coveted property; enjoying a rise in popularity in post-war USA, consumers were able to use their increased disposable income and leisure time to escape into the great indoors of a rural vacation home. You could even buy them flat-packed in Macy’s department store, imagine how dreamy that must have been, not entirely different to buying a doll’s house really! We don’t see many examples of these here in the UK, (though if you know of any, please do spill the beans immediately!) just adding further charm to this wonderful, scaled down house. I’ll leave you to further admire Steph’s handiwork, I’m off to trawl AirBnB for my nearest A-Frame escape! All images property of and used with kind permission from Steph Wallace, Mostly Miniature. Let’s hear it for the blues!